Crawl Space Vapor Barrier/ Heavy Duty Reinforced Liner For A Moisture Barrier What is Best for you? What's the best liner for you? It depends on the ground you are covering, and whether there is radon in your area. Will the crawl space liner be laying on top of sharp rocks? Some liners are stronger and more heavy duty than others. The stronger thicker liners are better suited for sharp rocky floors. Make sure that each liner below has been tested to the ASTM E 1745. This test says that the materials shall be subject to tests for water vapor permeance, tensile strength, and puncture resistance. Class A is the strongest liner. Lining a basement or crawl space is not fun. It's best to get it right the first time. Butyl Seal Tape-Double Sided Tape Used to attach the plastic to the foundation walls of the crawl space. Vapor Seaming Tape Used to seam the vapor barrier plastic together in the crawl space. Minimum overlap of 6 inches. We are often asked, "what is the best tape to use with crawl space vapor barriers?" Another frequently used tape is called Butyl Seal Tape. The Butyl tape has a reinforcement between double coated adhesive sides. This double-sided tape is used to attach vapor retarders to foundation walls, to protrusions, and ideally between overlapped layers of the vapor retarder as added insurance against penetration by water or water vapor (and many other types of vapors). This tape is permanently flexible, completely water-proof, and is incredibly sticky. It creates a permanent seal, which does not lessen over time. Very few tapes are as ideally suited to this difficult application as these two tapes. First many tapes do not adhere well to polyethylene sheeting of any kind. Second, the introduction of water or water vapor on a long-term basis adversely affects many tapes. Many tapes and types of adhesives age over time, and basically deteriorate. The tapes we use are high performance tapes that have been tested and used in these applications for decades. What percentage is recycled material? Is it better to use 100% Virgin polyethylene? I would like to use reinforced virgin polyethylene, may I provide the plastic to install. How will you install, tape and mechanical fasteners on the walls? What is the Water Vapor Transmission rate on your plastic? Before you hire a company to install a vapor barrier, understand what you are getting. 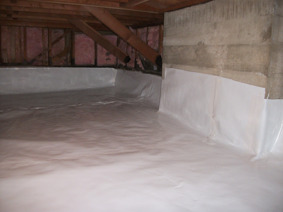 Read this article, 10 mil vs 20 mil Crawl Space Vapor Barrier- Which is best? DIY is an option. Please note our liners do not have any fragrance. They do not off-gas or have any odors.